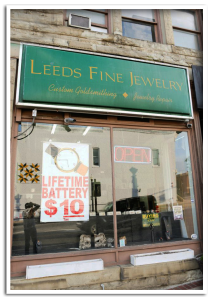 John Leeds, owner and operator of Leeds Fine Jewelry, has owned and operated his business in Richmond, Kentucky. Since, he opened the Leeds Fine Jewelry shop in 1992, he has a lapidary workshop in his studio/store. John will also be doing several art shows around the region. Leeds Jewelry takes returns for any reason w/in five days. Customer pays return shipping . Item must be in original condition and not damaged. If item arrives damaged, Leeds Jewelry should be contacted about the damaged item the next business day. No shipping to the following countries/continent : Africa, Brazil, Cuba, middle east, Turkey, and Venezuela. Jewelry Shipping Only: Same return policy as above, but we Only Ship To the USA,Great Britain, most of Europe, Costa Rica, India, Canada, Japan, China and most of South America, excluding Brazil.